When the snow begins to fall in November, Les Gets is transformed into one giant playground for snow sports lovers. Skiing and Snowboarding are naturally the biggest and most popular sports in Les Gets, but there are plenty of other activities on offer including cross country skiing, telemarking, tobogganing, snowmobile rides, husky dog sledging and ski joering. 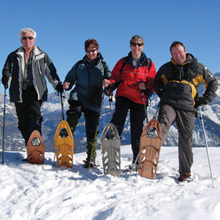 For non skiers or guests wishing to try something different there are also plenty of activities available including ice skating, paragliding, snow shoeing and day trips to neighbouring resorts and towns including Annecy, Thonon, Evian, Chamonix and Geneva. Les Gets is a fantastic resort for family and mixed ability groups. It is very easy to spend the day together skiing with each other using the same lifts, then choosing to take different runs down depending on your ability, to eventually all meet up again at the bottom for a vin chaud or hot chocolate in one of the many mountain restaurants. For the more advanced skiers and snowboarders we can also arrange day trips around the Portes du Soleil to take on the challenge of the PDS tour encompassing all 12 resorts (Les Gets, Morzine, Avoriaz, Chatel, Torgon, Morgins, Champoussin, Les Crosets, Champery, Abundance, Montriond and St Jean D’Aulps) dropping in and out of France and Switzerland. You can also take on the most demanding ski run in the Portes du Soleil, known as ‘The Wall’. Starting high up on the mountain peak at the top of Avoriaz you have to quickly make solid turns around the hugh snow moguls on very steep terrain. Finishing at the bottom in Switzerland you can then celebrate with a Swiss hot chocolate, before trying your luck using the Swiss Tbar lift systems! We can also take you on day trips to Chamonix (only 50 minutes away) to experience the stunning and thrilling Vallee Blanche, an unforgettable experience skiing or snowboarding down the Mer de Glace boardering between France and Italy. Normally during the daytrip you can also spend some time skiing in the other areas of the Chamonix Valley including The Grands Montets, Brevent, Flegere, Le Tour and Les Houches. We spent two years skiing in Chamonix so we know the ski area extremely well and would love to show you as much as possible in a day. Other day trip options include skiing in The Grand Massif Ski area (only 20 minutes away) which include the resorts of Sixt, Samoens, Flaine, Morillon and Les Carroz. We can also offer skiing day trips to the Aravis ski area (about 1 hour away) which includes the resorts of La Clusaz, Le Grand Bornand, Manigod and St Jean de Sixt. Les Gets offers over 100km of pistes and links into the massive Portes du Soleil ski area providing a combined 650km of pistes! To help you make the most of your time in this magnificent ski area, we will be happy to help orientate you around the resort and ensure you make the most of your holiday – whether that means exploring the long gentle green and blue slopes, or covering as many of the 207 lifts and 288 pistes available as possible! 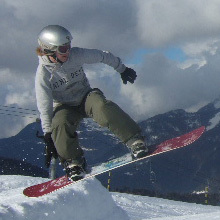 Snowboarding has grown popularity across Europe and Les Gets & the Portes du Soleil are truly a snowboarder’s paradise! 9 Snowparks, a Superpipe and every terrain imaginable – gentle wide open pistes, long steep descents and spectacular off piste routes. For beginners, the pistes of Les Chavannes and Le Pleney offer plenty of space for learning to turn with wide pistes and gentle gradients. Intermediates can take their first air on the friendly beginner parks in Morzine and Avoriaz which offer a progression of jumps, boxes and rails. There are boarder cross trails to race down and to practice your technique. Or just take your time and get some great photos! And finally for all those experts out there – there is the Snowpark d’Arare and the Superpipe…..for most of us, they are just fantastic places to watch in awe and take photos from a distance! Prepare to be inspired! 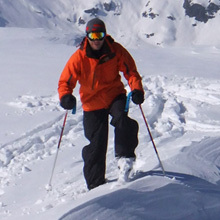 This can be an excellent way for non-skiers to experience winter conditions up in the mountains (it is also the way in which snowboarders reach many off piste areas). Snowshoes are basically frames to be strapped onto sturdy walking boots to increase the surface area covered by each step. Many of the full day treks can be hard work and more physically demanding than skiing. There are a vast variety of treks in the Portes du Soleil area and lifts can be used to avoid the strenuous walks up to enjoy a high altitude walk without the high exertion ascent! It is possible to hire raquettes (snowshoes) and ski poles from the local shops and hire a guide or use a guide book to find a walk appropriate to your level and fitness. 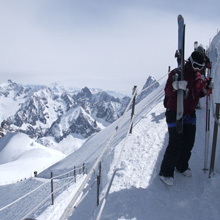 We can organise a day out to the Chamonix Valley to explore the Vallee Blanche and the stunning Mer de Glace Glacier. Hire a guide and take your camera! The famous 17km route descends through 2800m of stunning mountain views and offers the experience of a lifetime. It is available for skiers and snowboarders of intermediate ability and above but the risks of avalanches and dangers of crevasses make a guide an essential part of the day! Let RushAdventures hire a reliable and English speaking guide to take you on this stunning and memorable day. This is becoming more and more popular. Husky dogs (domestic dog/wolf crosses) are bred to work. They are wonderfully affectionate animals and are becoming very popular as pets. It is an exciting experience, not for the speed as it is little more than walking pace, but to be with these animals and in their environment. This is another experience that can be shared with all the family. 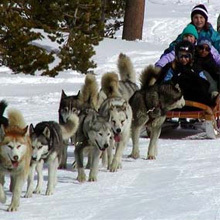 Companies offer sessions for adults to learn to drive the dogs themselves, or the opportunity to sit in the sled and enjoy the ride for younger guests. There are 18kms of marked cross country routes in Les Gets with many more accessible in the Portes du Soleil area. 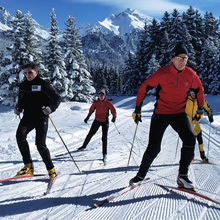 Cross country skiing can be a great way to explore the mountain on a leisurely tour, or at the other extreme – can be a gruelling work out that any athlete would be proud of! The versatility of the sport makes it suitable for children and therefore popular with families as a winter sport. As with all the skiing disciplines, rental equipment is available in Les Gets and RushAdventures can organise all of this for you! 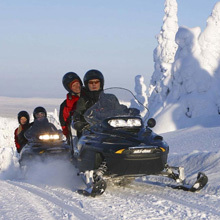 Experience riding on a ‘Scooter des Neiges’ whizzing around on the snow and enjoying the mountain in a different way! Great fun and an opportunity to give your legs a rest from skiing/boarding!! You can normally ride on the snow mobiles in the evening after the pistes have closed. Avoriaz and Praz de Lys have some of the best courses with your guide taking you around obstacles and trees and over snow bumps. This is a great activity to do in pairs with one person driving and the other person navigating! There is the opportunity to switch half way round the course. View the spectacular Portes du Soleil from the air and get a real feel for the massive scale of the area. Paragliding is, in effect, a parachute that inflates and flies needing nothing more to do so but the energy that is created by running gently down a hill using thermals to maintain and increase your height! 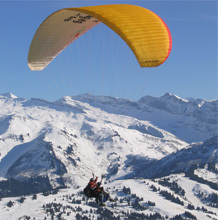 There are several companies in Les Gets and Morzine who offer tandem flights suitable for all ages. Normally you get about twenty minutes in the air to enjoy the view before you touch down in the village. Paragliding tandem flights make a great gift if you have a family or group member celebrating a birthday whilst staying with us. For the more adventurous, there are flights taking off in Chamonix that take you down the stunning Mer du Glace glacier. Les Gets has its very own custom designed bordercross. Designed with the help of Deborah Anthonioz the winner of a silver medal in the 2010 Vancouver Winter Olympics. The course is 523 metres long and features banks, step downs, step ups, table top jumps and transfer jumps. Test your skills on the course. You can even race your family and friends down the course to see who is the quickest! There is also a snow park on the Mont Chery slopes, which features rails, boxes and various jumps graded from green (easy) to black (hard). 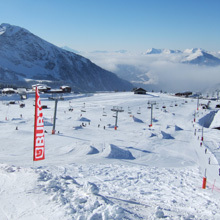 Avoriaz has a selection of snow parks with sponsorship from Burton snowboards. It’s great to try some jumps yourself, or just sit back and watch the pro skiers and snowboarders practising before the big winter competition take place.